Since China has a railway system covering more than 70,000 km with more than 1600 passenger stations, train travel has always been one of the major transportation means of Chinese people. For tourists traveling in China, train travel is much cheaper. There are three ways for passengers to buy train tickets. Usually there are several ticket windows in the ticket office of train stations. English language ticket window is available in some big cities. 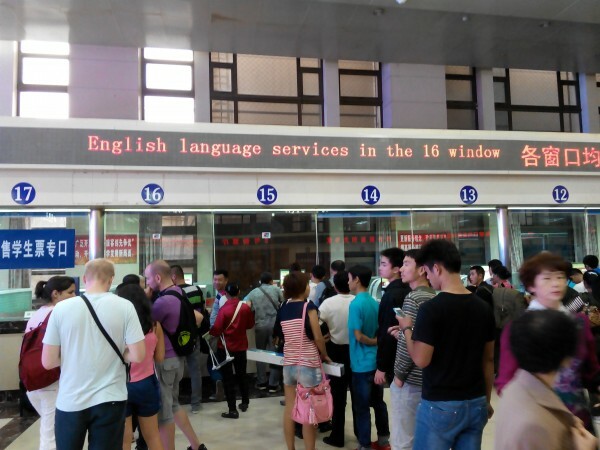 If there is no English window in the station, you can try to ask the working staff for help and they will find someone speaking English to help you. It is suggested that you write the train number, starting and arrival stations, date of departure on a paper and show it to the conductor. Ticket machines can only be used by Chinese ID holders. Ticket offices are scattered in the city. CNY 5 service fee charged for each ticket. The official train booking website of www.12306.cn . Only Chinese version is available. Passengers are required to register by one’s real name and use a China UnionPay Card to make an online payment. Therefore, it is difficult for foreign tourists to book by themselves. The pre-sale period of online booking is 60 days in advance. Telephone booking is available in a few cities and only Chinese language is available. ChinaTour.Net offers an online train booking service. We have train schedules in English. It will be very easy for you to find your target train. Then, we will book the ticket for you. Only a few service fee charged. Click here to book a train ticket. After the confirmation of the booking, you need to print out the paper ticket in the railway stations or ticket offices with the order number and the passport. Do I need special permits for the train from Xian to Lhasa 24 september 2016 ? If yes, how can I get this forms ?? Tibet permit is required when you get on the train. Foreigners are not allowed to travel in Tibet independently. You have to book a tour with a travel agency, then the agency will give you a Tibet permit. We offer Tibet travel service. Click here to book a Tibet tour. My family plan to tour China in particular Beijing and Shanghai this December. I planned to take the High Speed Rail to Shanghai from Beijing. As a Singaporean may I know how am I going to book for four tickets via on-line and to pay for these tickets? http://chinatour.net/train/ Input depart city and arrival city in the blanks, click “search train”, then choose the train you want and follow the steps.